When the word hit that highly anticipated third entry in the Guillermo del Toro Hellboy series was being dropped, many fans of the two films jumped up to shake their angry fists at the studio for dropping the film. 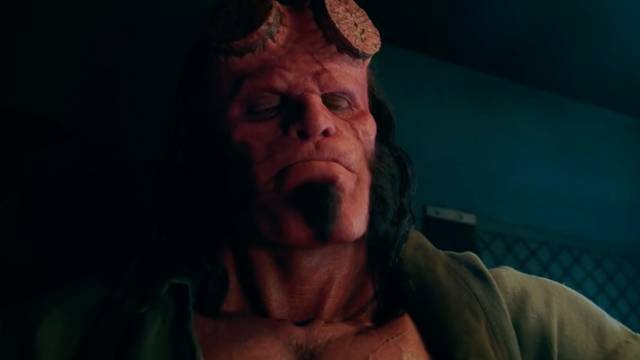 To throw salt in the wound, Lionsgate announced that they were rebooting the series without Ron Pearlman, who played Hellboy in del Toro’s films. With that being said, moviegoers already had this film stamped on their kill list out the gate, but does this film deserve it the kill shot, or does it prevail over its predecessors? This reboot focuses on Hellboy & his allies going up against Nimue, a character pulled straight from the Arthurian legends, while trying to prevent the apocalypse from coming to fruition. This reboot does well with balancing comedy, horror & action. The film without a doubt uses its R-rating to the max, especially towards the end of the film. Neil Marshall felt as though he wanted David Harbour to play it safe with his version of Hellboy & not make it his own. Harbour’s Hellboy slightly differentiates from Pearlman’s Hellboy but not by much. In fact, the only thing that separates the two is slight change in looks of del Toro’s & Neil Marshall’s Hellboy & the brutality displayed when Hellboy fights. For the majority of the film it felt as if I was watching a soft reboot with Pearlman still at the head. Mila Jovovich was a lackluster in this film & felt more like a B-list villain than one that moviegoers should feel would bring about unimaginable destruction. For a chunk of the film, Jovovich plays background to Stephen Graham’s Gruagach, a hog-like fairy who had a boiling hatred for Hellboy. Ian McShane & Sasha Lane were also pretty much forgettable in this film. At times I forgot that McShane’s Trevor Bruttenholm was in the film & the relationship between him & Hellboy was barely present & I didn’t feel the strong presence of father & son with McShane & Harbour as I did with John Hurt & Pearlman. Alice Monaghan played by Lane felt horseshoed in as opposed to being a character that was needed for the story to progress. Her sole purpose was to be the mediator between the dead & the living. Also, when it comes to some of the creatures, the animation is bad & the creatures feel out of place when in scenes with the other characters. Although the film had some shortcomings, there are some solid moments that keep it above the water. Like in the comics, the lore of Hellboy is finally fleshed out & his ties to King Arthur are touched on. The fight scenes were full on gory & the moments leading up to the climax of the film definitely used up the remaining juice or blood in this R-rated film. Daniel Dae Kim is the only character next to Hellboy that held down the film with his story & character. To be honest, his character held such a strong presence that a film based on his character is something I wouldn’t shy away from. Without dragging out the background of the main characters, the film did an excellent job with fleshing out the origin stories of each main character in the film. Overall, 2019’s Hellboy feels like it rolled out on the big screen with its training wheels still on but does have moments that show where those training wheels may come off in a possible sequel. Hopefully we get to see Harbour make the character his own in the next film & see a story that isn’t reminiscent of its predecessor. Hellboy's lineage is fleshed out. Daniel Dae Kim was one of the best things about this film. Nimue was a lackluster villain. David Harbour's Hellboy wasn't refreshing. The animation of the creatures in the film was not good. The story played it too close to the original film at certain points. Hellboy is known to the world at the start of the movie but it's never explained how they knew about him.